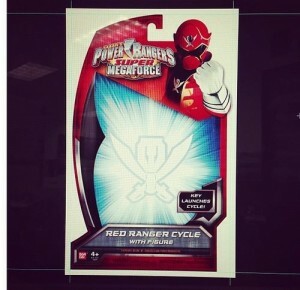 The latest Super Megaforce box art for upcoming have been leaked on Instagram showcasing the Super Megaforce Red Ranger Cycle. The Red Ranger Cycle might not appear on the show like other motorcycles such as in Power Ranger Samurai. On the box we can see the Super Megaforce logo and the box mentions a Ranger Key that can be used for the vehicle. It was mentioned that the original image was taken down. Power Rangers Super Megaforce will be an adaptation of Kaizoku Sentai Gokaiger where the pirate and other ranger keys will be the power ups for the current Megaforce (Goseiger) suits.